I have never been up-close with so many big names on a single day. 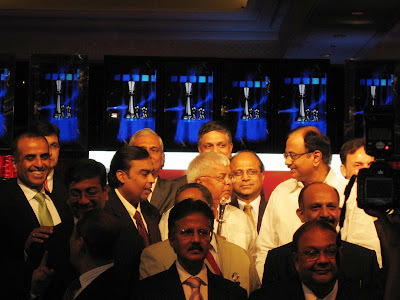 I was in New Delhi to attend an award ceremony hosted by NDTV Profit. 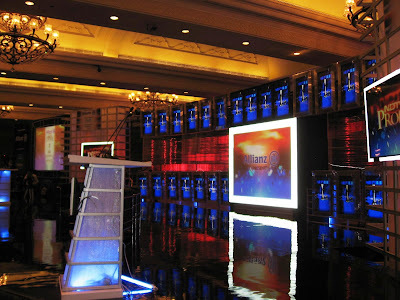 My flight arrived in the late afternoon and I checked into the Taj Palace, the venue of the event. 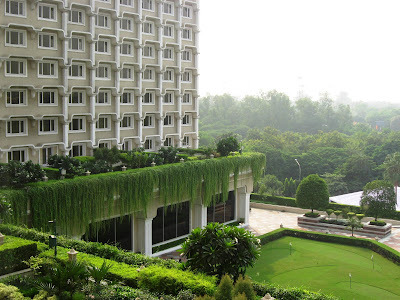 With a few hours to spend before the evening, I had set up a meeting at the Le Meridien hotel in Janpath. I walked out of the elevators and who should I run into, but His Holiness himself: the Dalai Lama! I managed to get a few pictures as he met with some Tibetian women who were waiting to pay their respects. Pico Iyer's The Open Road provides a fascinating insight into this larger-than-life man, revered not only by the Tibetians, but many around the world: "The fourteenth Dalai Lama is built like a middle linebacker but is nonviolent. A religious teacher who is telling people not to get confused or distracted by religion. He is considered a living god but insists over and over that he is just a man." 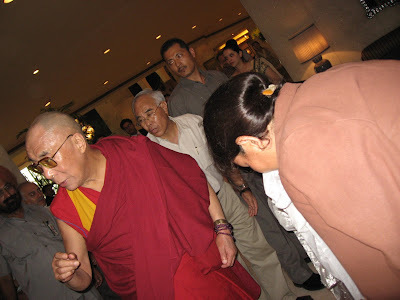 There has been recent concern about the Dalai Lama's health and I think he was here in Delhi for medical checkups. 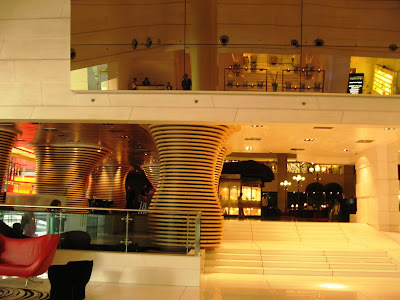 Here are a few pictures from my room, enroute, and at the lobby of the Le Meridien hotel. The meeting at the Le Meridien got over quickly, but I got caught in traffic on my way back. 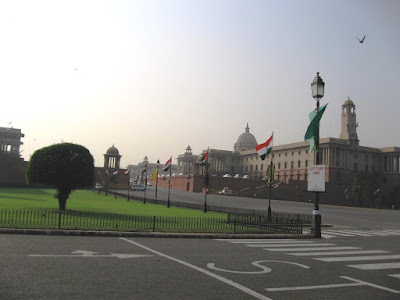 By the time I reached the Taj Palace, it was almost time for the big event. The hall was filled with people, many of whom show up regularly on TV and newspapers. The monotony of dark suits in the hall was broken only by the bright dresses of the female TV anchors. The ceremony went off like clockwork. Even the two ministers were on time (a rarity in India! ): Chidambaram, our Finance Minister and Laloo Yadav, our Railway Minister. In the hall this evening were the who's who of the Indian industry: Mukesh Ambani - head of Reliance Industries, and now #5 on the Forbes list of the world's richest people, Sunil Mittal - head of Bharti Airtel, India's largest mobile and telecom network, and many others. 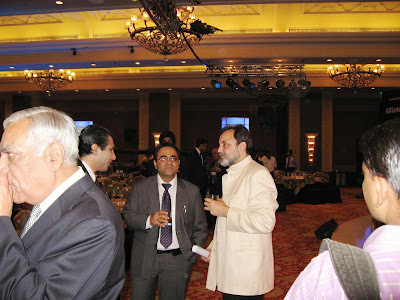 Of course, Prannoy Roy, Vikram Chandra and other familiar faces from NDTV were there too. The entire award ceremony took about 90 minutes (link). Sunil Mittal, the guy who (along with Reliance) brought the mobile revolution to India, made a strong case for making 3G ubiquitous in India, but not for fancy games and applications. He thinks 3G could be just the thing to get rural India empowered in a short time (education, insurance, mirco-credit, delivery other types of services through mobile telephony). He citied the example of how there are no longer any parking meters in London; all you have to do now is send an SMS to pay for parking; to extend your time you no longer need to come back to drop more coins (you only need to send another SMS). With the markets having crashed to another low during the day, and the quick Government intervention right after, there were lots of questions on the global financial crisis. Especially so since the Finance Minister was in the room with us. 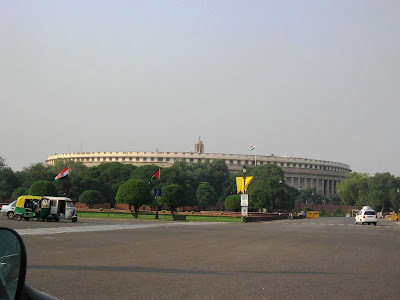 Most industry leaders and the ministers seemed to agree that India should not worry too much, even though we will see some indirect impact in the coming year. Mukesh Ambani spoke about how his new natural gas discoveries could meet 40% of India's current energy needs. When questioned about green alternatives, he repeated one of Thomas Friedman's favorite quotes from his new book, Hot, Flat and Crowded. "The Stone Age did not end because we ran out of Stones". The point being that we need to innovate ourselves out of of our oil addiction and move quickly to alternate clean energy sources; we should not wait for fossil fuels to end before waking up to the situation. He seems to completely agree with Friedman's point that whichever country takes the lead in Energy Innovation will probably have the most influence during the next several decades (like the invention of the computer did several years back). BTW, you have to read Friedman's book, it makes some very compelling points in a direct and easy-to-read manner. 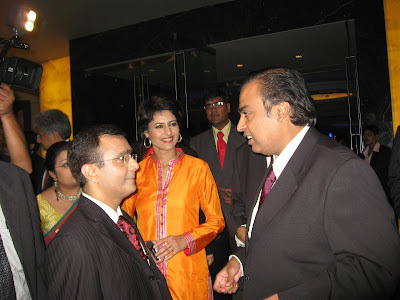 Given Reliance's ability to make big bets and their track record of execution, I would certainly like to see him move in that direction quickly. Laloo Yadav provided much of the laughs as he explained how he turned around Indian Railways which was almost bankrupt when he took over; he had some humorous anecdotes on recent meetings with delegations from Harvard and Wharton, who are doing case-studies. BTW, do you know the Indian Railways is the world's largest employer with about 1.5 million employees? The buffet dinner was good. The Indian section was mostly Hyderabadi (but since I had only recently sampled the real thing, I wasn't too excited). However, the Apple Jalebis for dessert were awesome! I didn't have time to sample any food from the hotel or the restaurants this time. Early in the morning, I was off to the airport for my flight back to Pune. This weekend I leave for a week's trip to the US: New Orleans, Roseville and Cupertino. I will be back with stories (and food) from these places soon. Finally, here's a picture of the Goddess Durga from this year's celebration in Pune. 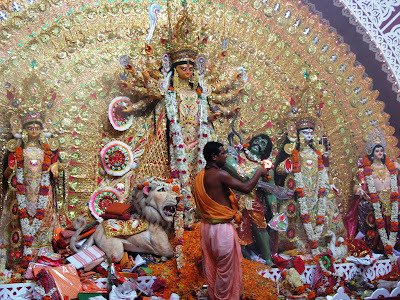 For those who are celebrating, wish you all a Happy Dussehra and Durga Puja! 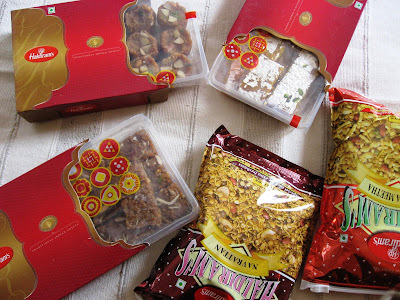 Thankfully, this time I was here with my family for this festival and I brought back some interesting festival sweets from Haldiram's at Delhi: Moong Dal Burfi, Doda and Pinni. wish you all a Happy Dussehra. You are very lucky to have darshana of Dalai Lama. I had received an invitation twice when he visited Mumbai, but like a fool I didn't wnt, then I went all the way to Mclodgegung, Dharamshala, but he wasn't giving public appearance. Meeting so many dignatories under one roof must have been one helluva experience, right? I feel excited like a 5yr old child who met a filmstar when I see your pics on Laluji and FM and Ambani...Hmm...Maybe i too will meet them in real one day..
@All: Thank you for leaving your comments here! I am travelling right now; will be back with posts on New Orleans soon. Meeting the DL eh! You really are an international man of mystery! Can you send me your email ID? I need it for some DesiPundit-related stuff. My email to your MSN ID bounced. Thanks. @patrix: I have sent back an email to you. @deepti: It was good (because it was so unusual!). Re: Oh Calcutta! : Good; I need to return there to try their regular menu. You did bump into some personalities! 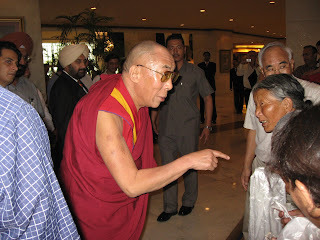 The closest I got to the Dalai Lama was on July 31, 2007 when he had taken a flight from Delhi to Leh while I was ready to take off in the opposite direction. That early morning, so much was the security that even though he had already arrived Leh a few minutes back, yet my tiny backpack was not allowed as cabin baggage but had to be checked in! @indicaspecies: Strangely, there was not much security when I ran into him. Probably, because it was an unannounced, private visit.